Hall of the Mountain King: Review: Fear Factory, "Mechanize"
Fear Factory’s latest record, “Mechanize,” shouldn’t be a hard sell for fans of the band’s groundbreaking first two records “Soul of a New Machine” and “Demanufacture,” but it might. After all, following those records, the band spiraled into an ever more commercial sound that culminated in a hit single for their fairly faithful cover of Gary Numan’s new-wave hit “Cars.” The band returned briefly to something similar to their early work with 2004’s “Archetype,” but quickly destroyed any goodwill built by that album with the lackluster “Transgressions” only a year later. Five years have passed since Fear Factory has done anything. Guitarist Dino Cazares and vocalist Burton Bell have worked out their differences, and they’ve recruited extreme metal drummer extraordinaire Gene Hoglan to provide the foundation for this record. The result is the record that should, logically, have come after “Demanufacture.” With two of the major creative forces of the band’s early work back in place, “Mechanize” returns to the original blend of pummeling industrial beats, thrash guitar riffing and Bell alternating between enraged growls and spacey melodic pieces. Nowhere is the shift back to the band’s basics more notable than on, “Powershifter,” the first song released a couple of months back to give fans a taste of the record. It was chosen with purpose, as an invitation to fans who have wandered away over the years, and perhaps as a bit of an apology. It opens with blasting drums from Hoglan, matched tightly by Cazares’ guitar. Bell rips into the song with snarls that are both aggressive and memorable. Then in classic Fear Factory fashion, he moves to a more thrash style vocal for the bridge and a melodic vocal for the chorus, which builds to a screaming crescendo. As one of those wayward fans, this song alone was almost enough to put me fully back in the fold. It certainly took me back to the mid-1990s when I first discovered the band. The first official single of the record, “Fear Campaign,” packs the same kind of punch, opening with a blast beat from Hoglan after a brief sample. The song could be pulled straight from “Demanufacture” with the very industrial verse and Bell again delivering clean melodic vocals and a nice hook for the chorus. It reminds me a bit of “Replica,” the single from that record. 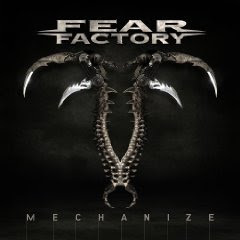 The electronics that were always a part of the Fear Factory sound are still here on “Mechanize,” but they don’t take center stage as they did on records like “Digimortal.” Instead, they’re pushed farther to the back and used in a more atmospheric way as they were on the early records. The songs here are all about punishing drums, guitars and vocals. That’s not to say that there aren’t some softer moments scattered, throughout, like the piano and chant-like effects that open “Christploitation” or the proggy opening of “Designing the Enemy,” which finds a synthesized melodic Bell vocal at the top of the mix for a moment. But those pieces are used primarily to offer brief respite from the sheer aggression that dominates. One quite interesting piece is the finale, “Final Exit.” The song opens with some melancholy clean guitars and a few samples, and it features perhaps Bell’s most stripped-down and raw vocal performance ever with very little effects on the verse. There’s a much more progressive feel to the song, an element that’s always been part of Fear Factory but never quite pushed to the front in this way. The song ends with a dreamy extended sequence with only keys and some effects that eventually fades into silence. It stands in stark contrast to the blasting power of most of what came before, and to be honest, I’m a little on the fence about it. It’s interesting in its own way, but as I listen to the record more, when the main portion of the song ends, I’ll probably go ahead and skip back to the beginning. “Mechanize” is definitely a tight, heavy record with the sound that I fell in love with 15 years or so ago when I first heard the band. Fear Factory is definitely back. Let’s hope they hang around for a little while this time.